Leave it to the Italians to take something as sad as leftover rice and turn it into an appetizer worthy of guests. Arancini are fried rice balls made from leftover risotto. They require just a bit of prep to make and are the perfect appetizer when unexpected, but still welcome guests, pop through your door. Leftover risotto is practically a staple in my fridge. Risotto, made by slowly adding liquid to plump arborio rice grains, is the perfect two person meal. It’s an easy way to use up those odds and ends in the vegetable drawer or any small portions of meat or seafood in your refrigerator. One cup of uncooked Arborio rice with plenty of added vegetables and meat makes two dinner size portions with a healthy amount of leftovers. In the past, these leftovers end their days in the back of my refrigerator; not looking particularly appetizing, but safe in their Tupperware thanks to my hatred of food waste. That will be the case no longer. Now that I’ve discovered arancini, I practically want to make risotto just for the leftovers. 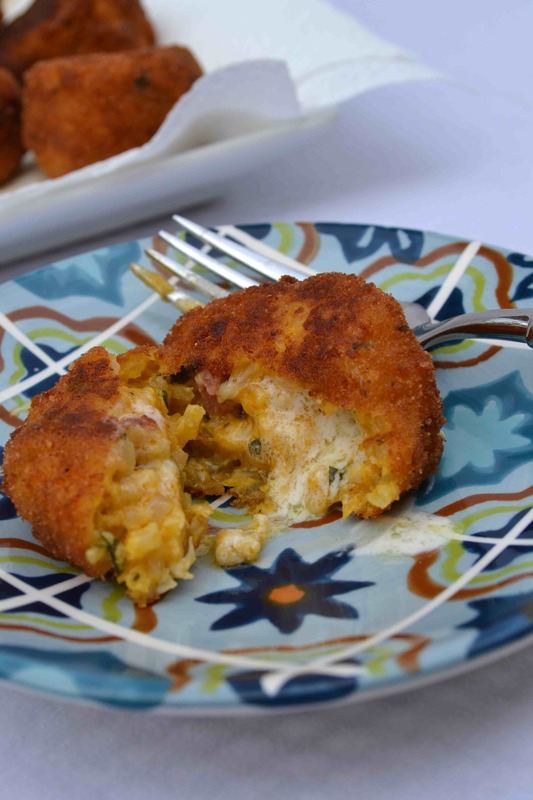 While you might suppose that arancini are dense, these fried risotto balls are just the opposite. Dredged in a light coating of seasoned breadcrumbs, the rice in the arancini becomes tender and light after being fried. Traditionally cooks stuff mozzarella inside of the rice balls before frying, but I used dollops of mascarpone (best described as Italian cream cheese) instead. The result was a creamy filling that oozed on my plate and delighted my mouth. While I can’t resist gooey strands of mozzarella (and will certainly fill future arancini with this classic cheese), I can’t say that I missed it. Mascarpone is a worthy substitute, although if using mascarpone instead of mozzarella, I do recommend scooping out 3/4 teaspoon balls of mascarpone on a plate and placing them in the freezer for 10 minutes before stuffing. It firms up the cheese making stuffing that much easier and less messy. Any leftover risotto may be used to make these arancini, but I’ve included a recipe for Roasted Cauliflower risotto below. 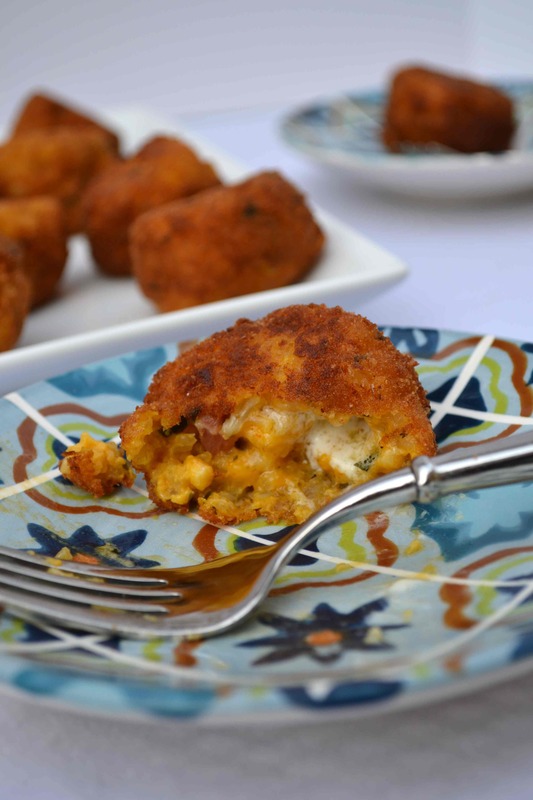 The leftovers from this recipe were used to make these arancini. Happy cooking and goodbye leftovers! If you don’t have 2 ½ cups of leftover risotto, simply add the egg to what you have and then add extra breadcrumbs until the mixture can be easily shaped into a ball. In a large bowl, stir together the leftover risotto with the egg until combined. Set aside. Place the dollops of mascarpone cheese on a small plate and place in the freezer. Pour the breadcrumbs on a shallow dish and season to taste with salt and freshly ground black pepper. 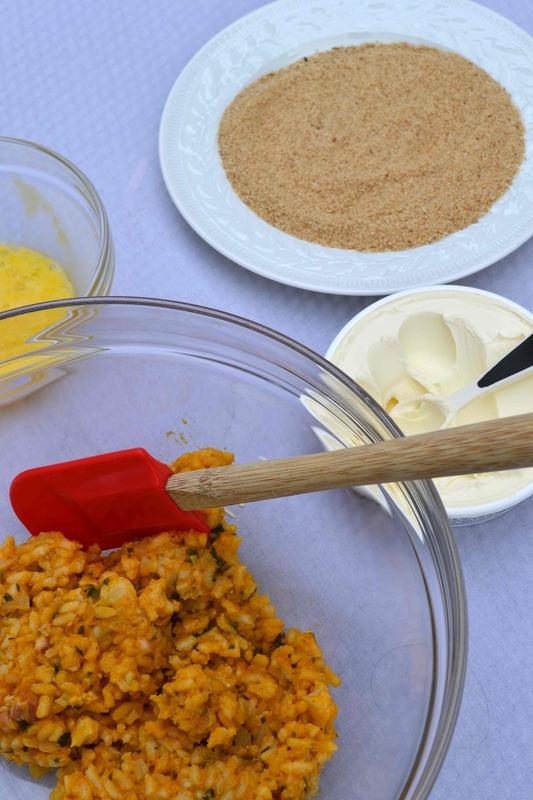 Roll the risotto and egg mixture into golf-ball size balls. Use your thumb to make a hole in the center of each ball. Remove the mascarpone from the freezer and drop a dollop of mascarpone in each hole. 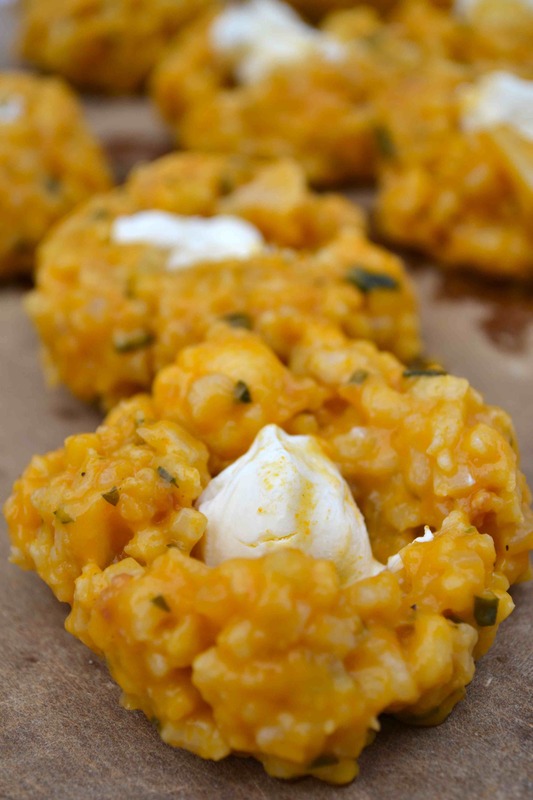 Shape the risotto back into a ball being sure to completely cover the mascarpone with rice. Dredge the risotto balls in the seasoned breadcrumbs shaking off any excess. Set aside on a parchment lined baking sheet. Fill a high-sided frying pan with about ¾ inches of oil. Heat over medium high heat until a breadcrumb dropped in the oil immediately floats to the surface. Carefully add the risotto balls to the frying pan (the oil should reach halfway up the sides of the balls). 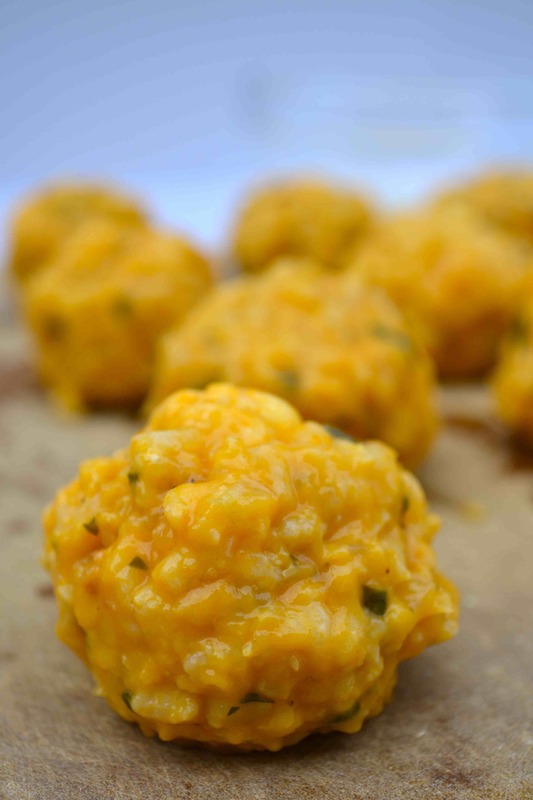 Fry until the submerged portion of the risotto ball is golden brown (about 2 to 2 ½ minutes) and then gently flip the balls over with a slotted spoon. Fry for another 2 to 2 ½ minutes. Remove the risotto balls using a slotted spoon and place on a paper towel-lined plate to drain. Serve immediately. Preheat the oven to 400 degrees. Toss the cauliflower florets in the olive oil and season with salt and freshly ground black pepper. Spread the florets on a small baking sheet and roast for 20 minutes. Remove from the oven and set aside. Heat the vegetable stock in a medium saucepan. Combine the butter and pancetta in a large pot. Heat over medium heat, stirring occasionally, until the pancetta is just beginning to crisp. Stir in the onion, celery, and finely chopped cauliflower stem and cook for 4 minutes or until just beginning to soften. Stir in the garlic and cook until fragrant, about 30 seconds. 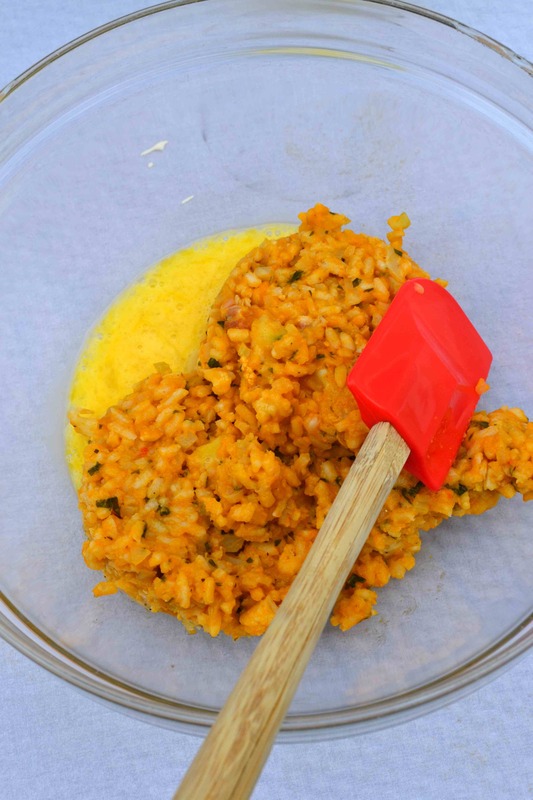 Stir in the Arborio rice and cook for three minutes until the edges of the grains are translucent. Carefully add the dry vermouth and cook, stirring constantly, until all the vermouth is absorbed. Add the stock in ladlefuls stirring well after each addition. Don’t add the next ladleful of stock until the first has been incorporated. When 2/3s of the broth has been added to the rice, add the roasted cauliflower florets and stir to incorporate. Add a ladle or two more of stock (you may not end up using all of it) until the rice is creamy, but the grains are still al dente. Stir in the parmesan cheese and season to taste with salt and pepper. Cover and let sit for five minutes. Stir in the parsley and serve immediately. Thanks, Jon! I adore mascarpone with tomato sauce (especially my lamb ragu) and I think it is equally good here. The next time you make risotto be sure to leave some for leftovers!